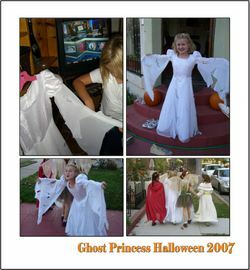 This year, Fake Niece Zoe wanted to be a Ghost Princess for Halloween. The annual costume making extravaganza is underway. No probs there chica! Fire up the Bernina and off we go. I used Burda 2463 and used white crepe backed satin, white organza studded with tiny crystals and white chiffon over top for the ghostly tattered layer. I let Zoe tatter her own costume, which she enjoyed greatly in the upper left photo. All in all the costume turned out extremely well and she looks lovely in it. I am biased, but you gotta admit it’s a good costume.